Hangouts 4 for iOS has been out for a month. Apparently, that’s the way it is or was. Hangouts 4 for Android is here, ready for download for your Nexus, Galaxy, HTC, LG, or, should you be so lucky, OnePlus Android device. 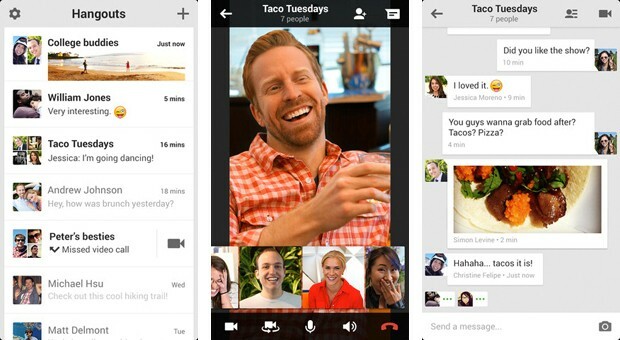 Google bless their month late and dollar short souls have announced and shipped Hangouts 4 for Andorid. •Sleeker — Now updated with material design, Hangouts has a new look and feel: items respond to your touch in more intuitive ways and transitions between tasks are more fluid. •Simpler — The new Compose button makes it easier for you to start a new group or conversation. Our streamlined contacts list helps you find the right person quickly. And attachments have been revamped and simplified, so sharing—of emoji, GIFs, your location, even multiple photos at once—is a snap. •Faster — Whether you’re sending a quick message or video chatting with family, you don’t want hold-ups. We’ve been obsessively fixing bugs and speeding up message delivery to make Hangouts faster and more reliable. Bonus: less battery consumption.